'It's hard to go into a refugee camp and find people who are interested in religion or politics, but go in there, or any other disadvantaged area, and throw a ball – you don't need to encourage anyone – they will all come running. That’s the power of football,' says Rwandan Eric Murangwa. There's no doubt the world loves it. Billions are currently glued to their television sets from Tehran to Tijuana transfixed on the football’s greatest superstars battling it out in the month-long FIFA World Cup. But Eric’s belief in the potential of the beautiful game goes above and beyond the average mourning England fan or opinionated armchair pundit. He sees it as society's greatest leveller, with the ability to bring people together, improve community cohesion and spread important messages that transcend the football pitch, whether that is a dusty field on the outskirts of Kigali in Rwanda or the painted lines of a rain-drenched rec in Tower Hamlets. It's no surprise that Eric places so much importance on the power of football. As a survivor of the Genocide in Rwanda, it was his relationships with fellow players and staff at his club Rayon Sports - where he played as a goalkeeper - that ensured he could outlive the 100 days of brutal violence and murder. His story of survival in which he is hidden by his Hutu teammates is the subject of one of our life stories for Holocaust Memorial Day 2015. Eric owes his life to football, and this is not something he has forgotten. His playing days were cut short by the genocide and his subsequent emigration from Rwanda to the UK, but now he is aiming to use the sport at a grassroots level to bring communities together both here and in his homeland. '[The gap left by football] became a vacuum in my life. I kept thinking something was missing in what I was doing,' Eric said. This became Football for Hope, Peace and Unity (FHPU), and its core values are rooted in the lessons from the genocide of 1994. The organisation aims to engage with young people in Rwanda to promote reconciliation and togetherness in order to prevent such atrocities from ever occurring again. It injects social responsibility into the game. Football’s power, Eric explains, is in its ability to capture the imagination of young people. Once they have been brought together, it is important for coaches to have the necessary skills to illustrate how lessons learned on the pitch can be taken into everyday life, such as notions of teamwork and respect. 'If they work as a team in their community, if they work as a team at school, the differences that create divided factions, which can disturb peaceful environments, are reduced,' Eric continues. Meanwhile, FHPU also organises 'play to remember' matches that focus on the memory of the Genocide in Rwanda. These take place in both Rwanda and the UK. Indeed Eric organised a successful event in Central London earlier this year as part of the Kwibuka 20 commemorations for the 20th anniversary of the Genocide in Rwanda. 'Youth teams come together to play in the name of remembrance and use that particular moment to highlight stories such as my personal tale of survival,' he says. 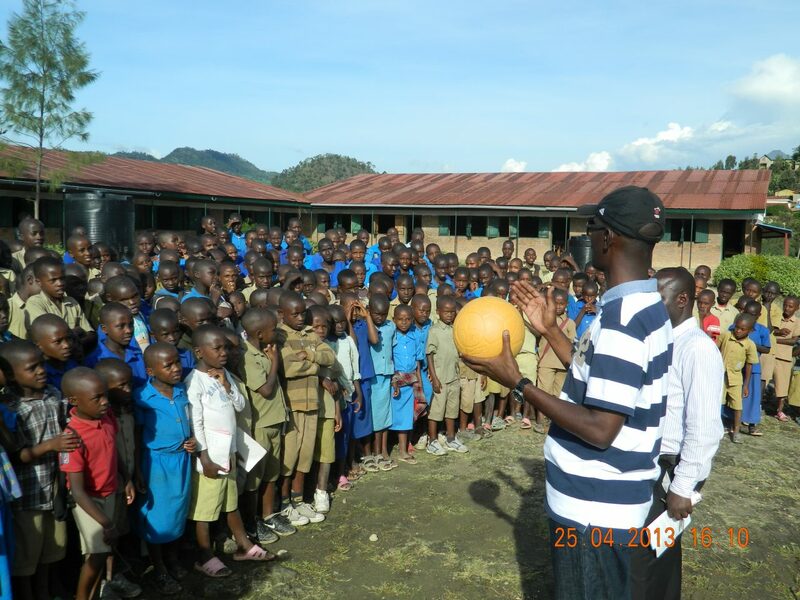 The approach of FHPU is very bottom up too, and it is working with other international organisations to take professional coaches from the US and the UK to Rwanda to empower local instructors and educators with the necessary skills to teach football in ways that can promote issues such as conflict resolution and gender empowerment. Eric's work is, however, not without its challenges, and one of the main issues is convincing people of the potential of football. Some people think it's just a group people kicking a bag of wind about and nothing more, while others believe the competitive nature of the sport is more likely to divide communities than bring them together. It only takes one look at the media furore surrounding issues such as racism and hooliganism, or even the fact that some players resort to biting their opponents, to understand where these opinions come from. 'It's going to be a long process to make people understand that football is one of the best ways to educate people,' he said, adding that once people see its power first hand, hear what the coaches have to say and the ways that the young people react, they are quick to change their view. The rise of other sporting organisations trying to enact social change is evidence of its growing popularity. At this year's World Cup, the organiser FIFA's very own similarly named initiative Football for Hope has been plastered on the advertising hoardings, while Football Beyond Borders has worked in the poorest areas of Salvador in Brazil in the lead up to the tournament to work with locals in improving English language skills. While the world’s gaze may be transfixed on the likes of Lionel Messi and Neymar throughout the World Cup, it is vital to remember that it has the potential to do more than just transform the lives of those gifted enough to become global footballing superstars.